An exceptional person. A high-school professor of theology and physics. Passionate and proud to be Romanian. Boundless energy and devotion to bringing folk culture to life. Katherine and I first met him in 2000. With several friends we gathered in his small apartment-bloc home to hear him explain the symbology embroidered into folk costumes. This was a revelation as up to that moment costumes had merely been colorful examples of peasant clothes. His study of female costumes, particularly in Maramures, led him to conclude that the stiched patterns represented more than simple decorative motifs. In his words, the costume itself is “a temple carried on a living being.” The symbolic language expressed on a costume links back to pre-history lore. An example is the “axis mundi” centered on a paradise island from which grew a primordial tree, its roots in hell and its branches reaching into paradise. 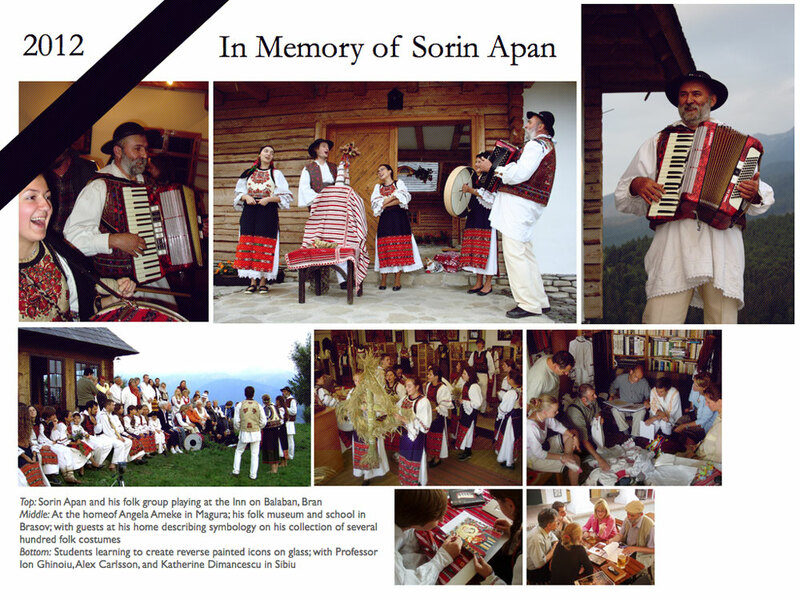 For years after, he brought his knowledge and young folk group to guests at our Inn on Balaban in Bran. He introduced us to a much deeper, spiritual side to folk culture. This he shared, too, with multiple groups on visits to Germany organized by our friend Angela Ameke. Her home in Magura became a calm refuge for Sorin on occasion. We met him on other occasions in discussions with Professor Ion Ghinoiu, editor of the fivce-volume Ethnographic Atlas of Romania. I last saw him in May 2012 at the office of his friend Horia-Roman Patapievici, head of the Romanian Cultural Institute in Bucharest. We talked about his travel to the United States for medical care of advanced cancer. This was the last I saw him. He leaves behind a family and young children. He departs having passed his knowledge and passion on to a young generation. His legacy will long endure.